Mount Elbrus with its altitude above 5000 meters is the highest of the eight giants in the Caucasus – a mountain range that stretches 1 127 km between the Black and Caspian seas. Elbrus is the highest peak not only in Russia but also throughout Europe and as such is subject to the wishes of many climbers from around the world. After the ascent of Mont Blanc in the Swiss Alps, usually the eyes of climbers are geared towards the Caucasus and the majestic Elbrus and its two tops. Elbrus is actually composed of a huge cone, ending with two peaks - East - 5621 m and West - 5642 m, separated by a saddle, with a height of 5322 meters. The territory of Kabardino-Balkaria, an autonomous republic in Russia, near the border with Georgia is home of this peak. It rises north of the main Caucasian ridge, which connects it to the pass Hotyu-Tau. Elbrus is within the boundaries of the national park Prielbrusie that extends 1/12 of the country. Balkar Elbrus has the name Mingi Taw, which means "a thousand mountains" and the Kabardian - Oshkhamakhua, which translates as "mountain of happiness." 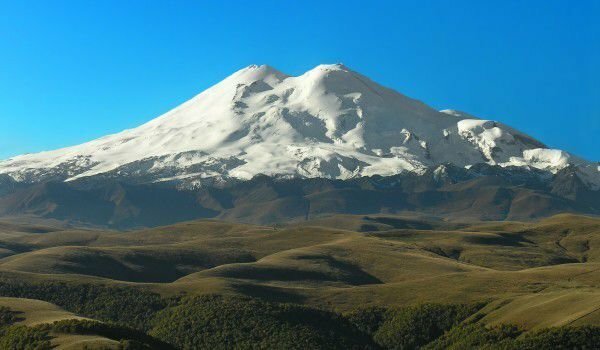 The Turks called Elbrus, Jin-Padishah, and its Turkish name is Yalbuz ("ice mane "). Quite a few legends hover around Elbrus, coming from the ancient Greeks. Greek mythology connected with Elbrus legend of Prometheus, who stole fire from the gods to give it to people. The gods are angry and nailed him to the rocks, with one hand on the East and the other on the West peak. The curse envisaged that every day a huge eagle was to descend and devour his liver. At night, his wounds healed and everything was repeated until he was saved from the pain by Hercules, when he killed the eagle. Elbrus itself is a very beautiful and majestic mountain. Its slopes are covered with bizarre frozen magmatic rocks, which are a remnant of volcanic activity. The eastern tip of the mountain retains of a secondary crater with a diameter of 200 meters and a depth of 50 meters. Elbrus is dotted with snow fields and glaciers with an approximate area of 130 square kilometers. In the bowels of the Elbrus volcano are still raging processes. Evidence of this comes from the smell of sulfur, which is mostly felt in the morning. On the southern slope of Elbrus are built lifts, called Azau from the meadow at 2300 feet to the shelter "barrel" - at 3800 meters. On the same slope, at 4150 feet, you can see the remains of the burned during August 1998 "Refuge of eleven". In 2001 a new building was constructed in the same place, about 4.5 km from the summit. This kind of accommodation is called "Shelter of the eleven" (Russian: Refuge 11) and has 50 beds in 12 rooms with 4 to 6 beds. This shelter on Elbrus is the highest located hotel in the world. After this, second is the Himalayan "Hotel Everest View", some 3380 m below the peak of Everest , the third is "Machu Pichu Sanctuary Lodge", at 2430 m in the Andes, close to the ruins of Machu Picchu . To the east, Mount Elbrus is climbed for the first time on July 22, 1829, at 11:00, from Kabardian Kilar Hashirov. To the saddle, he is accompanied by the Balkar Ahia Sottaev, who goes back to accompany the other two group members who become ill. In 1868 Ahia Sottaev steps on the eastern tip, leading from the Royal British Alpine Club. This is the second ascent of Elbrus and became a reality on 31 July at 10.40 hours. After six more years Elbrus was again conquered by the British, along with Ahia, which climbs on top for the third time. On July 16, 1874, at 11 o'clock, the already 86-year-old Sottaev climbs the highest point in Europe, Caucasus and Western Elbrus. With him are Grove, Walker, Gardiner and the Swiss man- Knubel. Along with the highest located hotel in the world, Elbrus can boast with even more records. In 1956, Alpine record has been placed, when 400 people mass climb on top to celebrate 400 years since the release of Kabardino-Balkaria from Ottoman rule in 1556 by Russian troops and the formation of its autonomy. In 1997 there was an amazing record in the Guinness Book written- in, with the conquest of Mount Elbrus in a "Landrover".